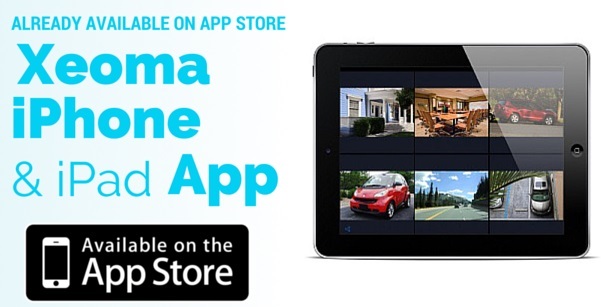 Xeoma security camera app for iPhone and iPad is perfect for remote view of your cameras. 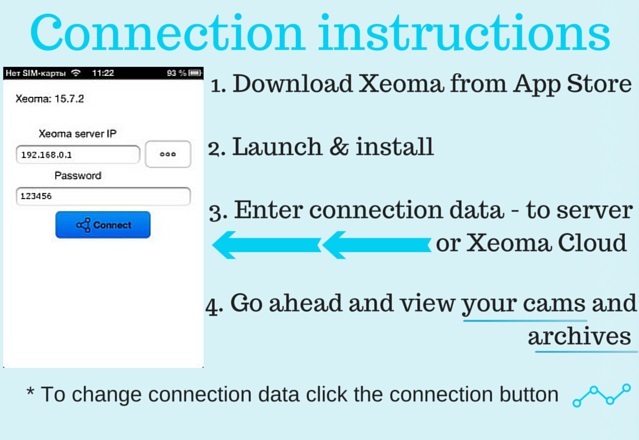 It can be used to connect to Xeoma Cloud or Xeoma server on your desktop or tablet, even with behind firewalls (with the help of Repeater service). With this iOS client you can connect to your Xeoma to view camera’s live feeds and archived recordings, with sound, and ability to zoom the picture digitally in/out, from wherever you are! Take it with you to vacation, business trip, to the place of work. Peek in when you have time at your babysitter or seniors or make sure those you care about are safe in hospital. 1. Go to App Store and download Xeoma webcam app from there. 2. Once it’s downloaded, it will be launched and ask to install. 4. If the data is correct and the server part is available, you will be connected, and will be able to view your cameras and their archives. 5. You can go back to the connection dialog window to connect to another server. Click the connection button below. That’s it! With Xeoma security camera app you can enjoy remote access to your Xeoma from anywhere at any time!